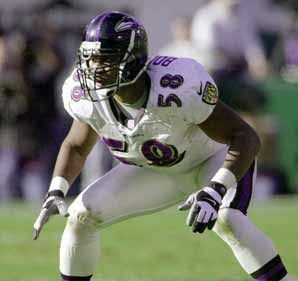 A defensive end in college, where he gained notoriety for his pass rushing, Boulware was taken by the Ravens in the first round (fourth overall) of the 1997 NFL draft. Converted to outside linebacker, he moved directly into the starting lineup, joining fellow rookie Jamie Sharper and second year MLB Ray Lewis to create a young but formidable linebacking corps. Boulware followed up on his outstanding rookie season by gaining selection to the Pro Bowl following the 1998 and ’99 seasons and was also recognized as a first-team All-AFC choice of Pro Football Weekly and second-team All-NFL pick by the Associated Press in 1999. While a shoulder injury caused his performance to level off, he was a mainstay of the defense in 2000 that fueled a late-season run culminating in victory in the Super Bowl. In 2001 he was shifted to defensive end during the season due to injury depletion and the result was a club-record 15 sacks. Boulware returned to outside linebacker and gained selection to two more Pro Bowls in 2002 and ’03. However, his string of 111 consecutive games was broken when he sat out the 2003 season finale due to injury and offseason knee surgery cost him all of 2004. He was released and re-signed to a lesser salary in ’05, playing as a reserve, and injuries forced his release and retirement prior to the 2006 season. Overall, he had 70 regular season sacks and three in the playoffs over the course of his career that included four Pro Bowl selections.